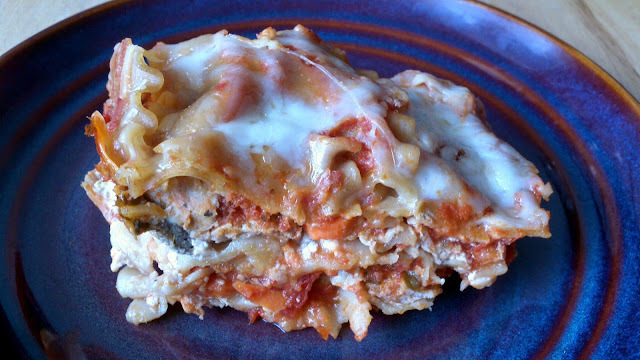 Lasagna in the slow cooker means there is no need to cook the meat and pasta before assembling! The recipe from which I adapted this was much higher in saturated fats, so I heavily reduced the amount of cheese, swapped sausage for ground chicken (you could also use lean ground beef, but chicken was half the price! ), and added more veggies. For the veggies, you can dice them and keep them chunky, like I did, or you can food process them to "hide" them to make the dish kid friendly. You can swap whole wheat pasta for gluten free if needed, or use low fat cheese if you prefer (personally, I prefer to reduce the amount of full fat cheese than use low-fat!). The lasagna freezes and reheats well. Grease bottom and sides of slow cooker pot with Canola spray. In a large mixing bowl, combine ground chicken, chopped or food processed veggies, herbs and black pepper, and mix together using a wooden spoon. Layer 1/4 of the marinara sauce on the bottom of the slow cooker, followed by a layer of uncooked noodles (break noodles as needed to fit the size and shape of pot). Add 1/2 of the meat mixture on top of noodles. Next layer 1/4 of marinara sauce, followed by another layer of noodles. Add a layer of ricotta, followed by remaining 1/2 of meat mixture. Add 1/4 more sauce, followed by third layer of noodles. Top with remaining sauce, mozzarella, and parmesan cheese. Cover and cook on low for 4 hours. It is not recommended to leave lasagna on 'warm' setting after 4 hours is complete (noodles will over cook).